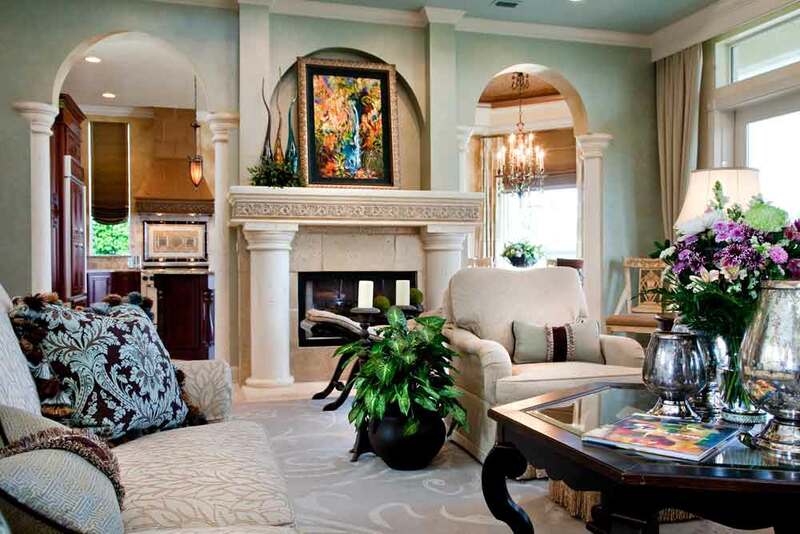 "This French Mediterranean Style Home is abundant with texture, light and color! Every wall in this house has a faux painted finish and every room is a different color. The owners reside in Wisconsin most of the year, but wanted a retreat in the south that was entirely different from the rich dark wood interior of their homes up North. The house had sat on the market for quite some time, as the open floor plan was a challenge for prospective buyers. We seized the opportunity and gave this home exquisite views, an abundance of seating for large family gatherings, and a gallery walk to exhibit their beautiful art collection. The final design element was achieved by gathering my resources to create an exterior that mimicked the traditional French allure of the interior. Landscaping, custom iron work on the house and around the pool, new lighting, painting and an outdoor living space."